Thanks for your viewing ,if you are interested ,pls sent me inquiry ! ! ! what is the advantages of our P1.667 led display? our most basic guarantee: the aging time exceeding 24 hours. Malfunction dot rate less than 0.0001. 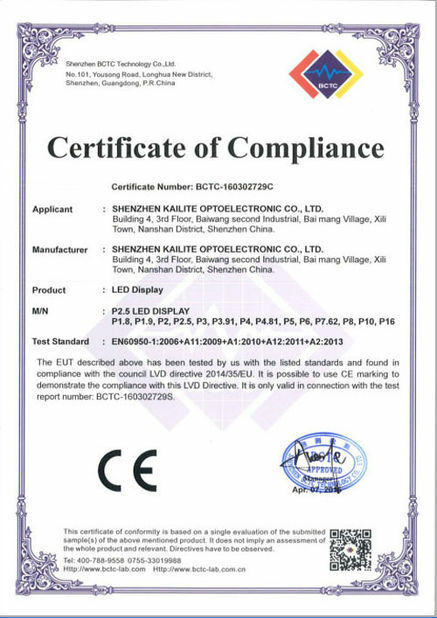 MTBF more than 10000 hours.we assure high brightness and long lifespan. 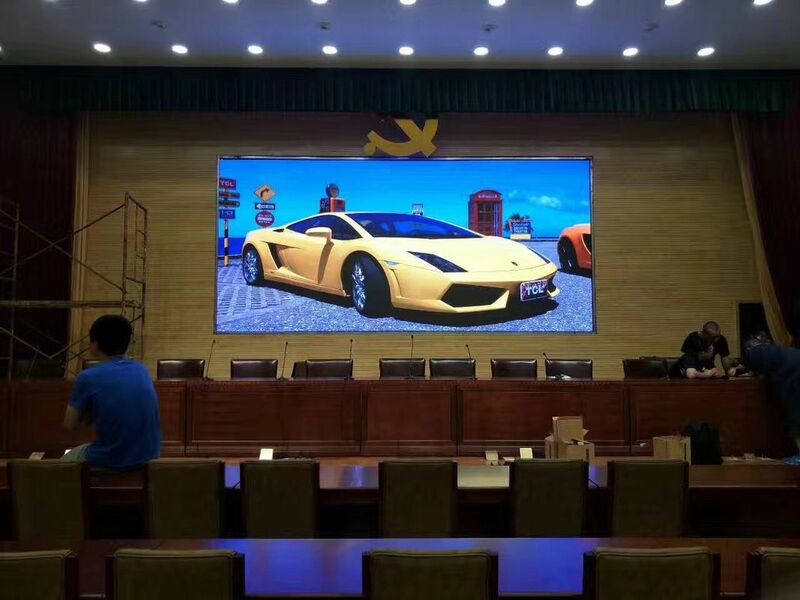 High brightness and clearly led display effect with easy use control system which allow you easy become enviable led display experts. We are a professional manufacturer, has its own factories and production lines. Without middlemen and trading companies, our price is more competitive, quality is more reliable. Our price is more competitive, quality is more reliable. kailite has several auto production lines equipment with Taiwan auto-encapsulate machine, Taiwan Chang-Yu handler, and the production of LED meets the demand of high quality standard LED display. automatic production line with the characteristics of reducing the cost of labor and management. 4. Light weight:aluminum cabinet greatly saving fright cost and conveniently installing. dot rate less than 0.0001. 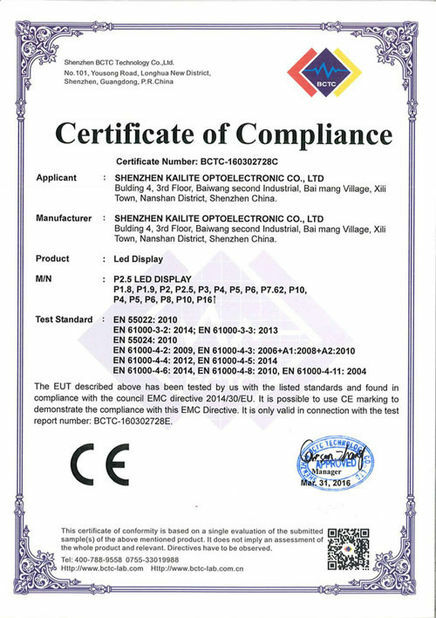 MTBF more than 1000 hours. 6. Supporting different formats of images and videos:Flash, WAV/MIDI, Videos from TV and other equipments. 8. Any questions can be answerd quickly within 24 hrs. Q: What is the brightness, viewing angle and wavelength of the LED? Viewing Angle is the total cone angle in degrees encompassing the central, high luminous intensity portion of the LED beam from the on-axis peak to the off-axis point where the LED intensity is 50% of the on-axis intensity. This off-axis point is known as theta one-half ( 1/2). Two times 1/2 is the LEDs' full viewing angle; however, light is visible beyond the1/2 point. Q: What is dominant wavelength? Please specify the ranges of wavelength in red, green and blue color respectively. Q: Which chip vendors are you buying from? Q: What is the chip size you're using for outdoor display? How about indoor display? Q: How much will the brightness of LED drop down after 1000hrs? We welcome new and old customers from all walks of life to contact us for future business relationships and achieving mutual success.